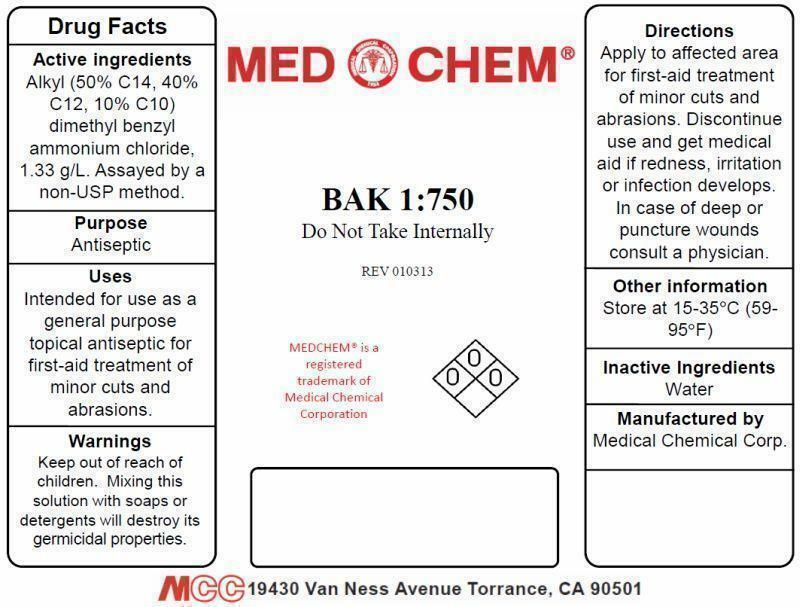 Active Ingredient: Alkyl (50% C14, 40% C12, 10% C10) dimethyl benzyl ammonium chloride, 1.33 g/l. Assayed by a non-USP method. Warnings: Keep out of reach of children. Mixing this solution with soaps or detergents will destroy its germicidal properties. Uses: Intended for use as a general purpose topical antiseptic for first-aid treatment of minor cuts and abrasions. Caution: Mixing this solution with soaps or detergents will destroy its germicidal properties. Usage: Apply to affected area for first-aid treatment of minor cuts and abrasions. Discontinue use and get medical aid if redness, irritation or infection develops. In case of deep or puncture wounds consult a physician.